Juvenile Justice 6 Edition Gain a practical and comprehensive understanding of the juvenile justice system with JUVENILE JUSTICE, Sixth Edition. 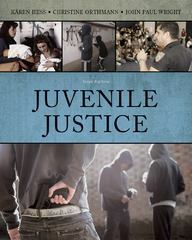 Highly accessible and reader friendly, this book explores various programs and processes that exist in today's juvenile justice system, including prevention efforts through school and community-based programs. The Sixth edition features a prestigious new coauthor--John Paul Wright from the University of Cincinnati--and provides a new emphasis on evidence-based practice and other cutting-edge issues such as cyberbullying, school violence, female delinquency, and more.